This conference has the goal to commemorate the year of Mathematical Biology 2018. The idea of this special year was born four years ago as a joint effort of the European Mathematical Society (EMS) and the European Society for Mathematical and Theoretical Biology (ESMTB) and is arriving to an end with this thematic program at the Institute Mittag-Leffler. In the week, October 8th to 12th, we have decided to showcase some of the most active areas of research internationally in Mathematical Biology. Each day will be devoted to one particular research topic: morphogenesis, the spread of disease, collective behavior and clinical applications. 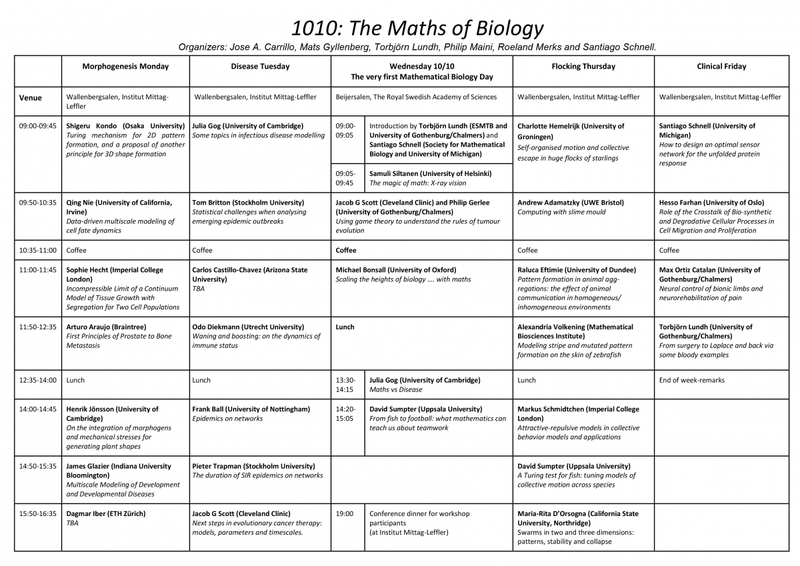 The first official day of Mathematical Biology will be launched with a special series of public talks on the 10/10 at the Swedish Royal Society of Science. Our logo of the year of Mathematical Biology reminds us about the different processes of differentiation, collective motion and morphogenesis leading to our 10 fingers in arms and legs that in turn led to the decimal system. Let us celebrate the huge increase and importance of applications of mathematics to biology and life sciences and let us open our minds to embrace the new challenges for Maths in Biology ahead. Schedule updated per 5 October. Click on the image for a larger version of the schedule.